I'm getting a strange issue with WB on the latest release of Windows 10 (v1803). Whenever I open the Task View, either by clicking the button on the taskbar or by pressing Win+Tab, the Task View behaves very erratically. It basically refuses to close, and renders my mouse unusable. Unloading Windowblinds doesn't seem to fix it, I have to fully uninstall WB to get Task View to behave correctly. I have forwarded your report to the Stardock support team for their review and recommendations. Please keep an eye on this thread for any updates. We really do appreciate your feedback, thanks. I have this same issue and unloading WB does not bring back normal functionality for me either. There is also no way to disable Task View under the Per Application section either unfortunately. Reboot and please report back. Tried purge, reboot, and reinstall; same result. Update: it seems to do this even with WB purged from the system. My money's on Task View itself being broken. Will monitor this and update as new developments arise. Possible. Also, there is a WB update pending but I cant comment (yet) on what is included in the changelog or when it will be released. Keep an eye on these forums for any updates. I think the issue probably resides with the new feature in Task View where there is a history of previously opened application windows below the virtual desktops that are now at the upper-left instead of at the bottom of the screen where they used to be. That seems likely. At this point, I'm going to roll back to v1709 and wait for the inevitable hotfix patch. Task View's new feature is not broken. Windowblinds does not play well with it. It will cause the activity history feature to hand. Please let us know when Windowblinds is updated to accommodate the changes. I have v 1803 and WB installed. No issues whatsoever. Task View, which I believe is now called Timeline is working as expected. So, in my experience at least, task view isn't broken, and neither is WB. Task View and Timeline are two different things. When I right click the taskbar, I am offered the option to show/hide TaskView button, which is the button that opens timeline. Can you post a screenshot so I can see it working as expected? Does it continue to work normally if you add multiple desktops? Haven't used it. I'll check for you though. It's not really something I use. I'm just trying to help. 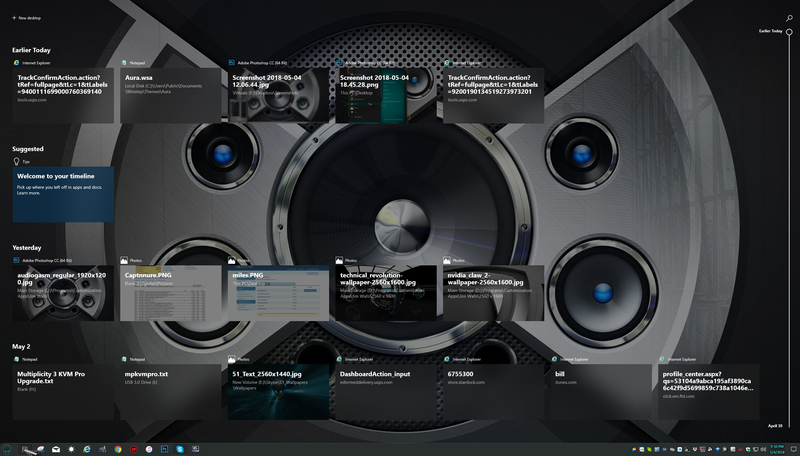 Ok, I added a few desktops. It is a tad quirky, but it works. It took a few extra clicks. It does appear to be buggy. But once I clicked about 3 times, I got back to my normal desktop. Personally, I think I just need to learn to use it. I never really have, so maybe there's a learning curve? Same problem here on version 1803. Click on timeline with WB installed, and everything freezes. Uninstalled WB, and timeline works flawlessly again. Hopefully a bug fix is coming in the near future so I can reinstall. Other than that, love WB! Another WB not compatible with 1803. Timeline doesn't work at all and TaskView won't create new desktops or allow moving apps to different desktops. Unloading WB doesn't help. It has to be uninstalled. Hope there's a quick fix! We have this resolved for the next WB update. Turns out the new taskview code is a little fragile and didn't like a specific value. I am hoping we can put this out in some form later this week or early next as there are some other fixes in development too. One thing I did find is the taskview is liable to not work or crashes out explorer on occasion without WB running too so there may be some other app out there causing it to get upset as well. Just here to confirm the issue. I don't have much running on my machine other than Object Desktop, Office 365, Adobe Suite and Avid Pro Tools. No third party AV. Windows 10 Pro 1803/ build 17134.48. I'm thinking of doing a clean, updated reinstall from scratch... Win10 v1803 because v1709 had that daunting "Window appears, disappears" issue with WB10 and I never figured out what it exactly was, I just learnt to live with it and use WBLoad.exe in case I wanted to refresh the theme. I could wait for the new WB update. Until then, Win7 as my backup OS still works like a charm. Any idea when will the update be released? Any update on when the next Windowblinds update will be released that resolves this issue? I just updated my Object Desktop subscription right before this started happening with the most recent Windows 10 update. Windowblinds is my main reason for renewing and so far it has been a waste of money since I currently cannot use Windowblinds on my Windows 10 machine.